In the past few years I have published many blood orange recipes. 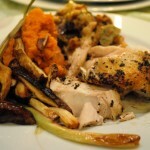 This recipe is my 2013 version for roast chicken. 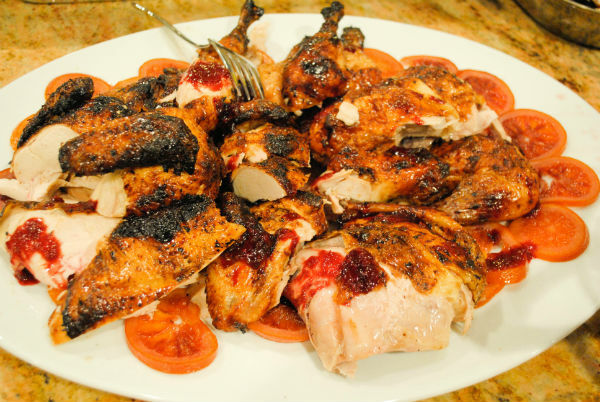 Roast chicken fills a home with an aroma that says family, good food, Shabbat celebration and is one the top comfort foods for me. Over time I become more fascinated with the striking appearance and delicious complex flavor of these oranges. I have gone so far as to plant two trees. 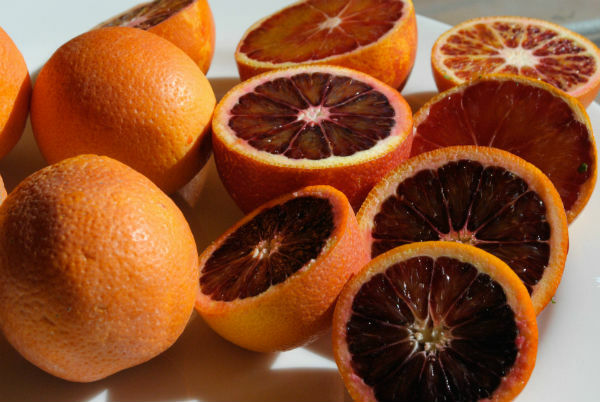 Right now it is the height of blood orange season. I had a good idea on Wednesday at the Santa Monica Farm Market to buy a few dozen, squeeze them and freeze the juice in 3 cup containers. On Passover everyone loved this chicken and blood orange sorbet was the first to go. 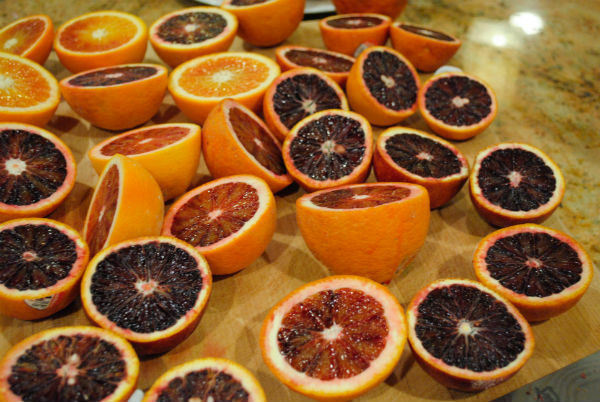 Blood Oranges can be found at farmers markets and upscale markets. The California season is from December to May. 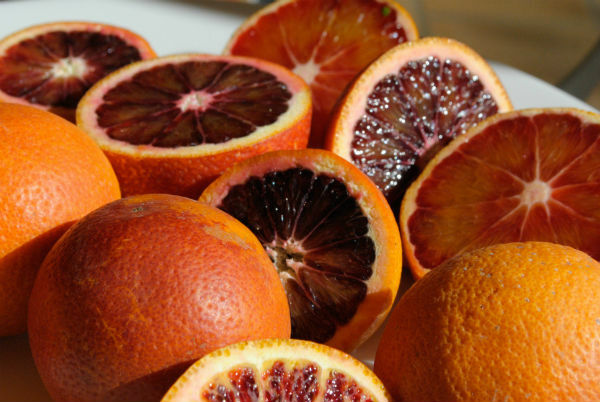 Blood oranges were probably cultivated after the mutation was found on a sweet orange tree in Italy. There are several varieties with coloration ranging from pink tinged, to red streaks to deep dark crimson flesh. Look carefully at the pictures I took. The most common variety is the Moro typically a dark crimson.. There are also Tarocco and Sanguinellos available. 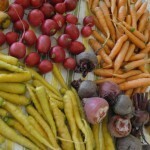 I think next week I will make marmalade! Salt is optional since I use kosher chicken. Trim any excess fat round openings of chickens with a scissor. Remove any gizzards or necks that may be in the cavity. Pat chicken dry. I ware cloves to do this. Do not wash chicken as it spreads salmonella around your sink area and the high oven heat will kill anything on the chicken during cooking. 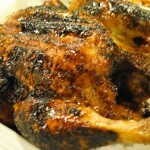 Place dry chickens in individual zip plastic bags and set bags aside while preparing marinade. Place garlic cloves, olive oil, and lime juice in a mini processor. Pulse until pureed. 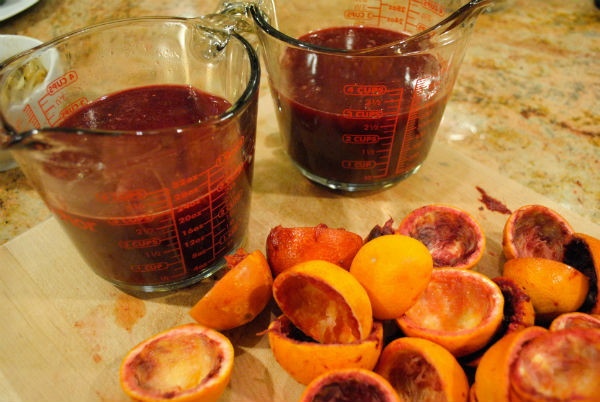 Mix orange juice, date syrup, and pureed garlic mix together in a small bowl or pitcher. Place 1/3 cup of marinade in each chicken bag. Seal bag, pressing out any air, turn chicken in bag to distribute marinade all over chicken and let chicken marinate for about 4 hours in refrigerator, turning about every 2 hours. Pour remaining blood orange mix into a small sauce pan. 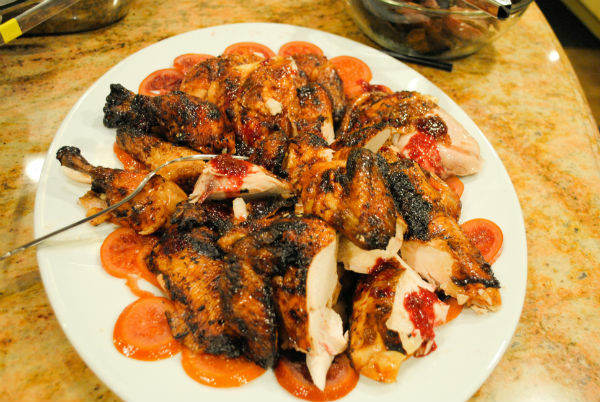 With heat on medium, bring juice to a boil and reduce juice to a syrupy sauce to use with cooked chicken. Take chickens out of refrigerator about an hour before you want to cook them, so they reach room temperature. Heat oven to 400°F. 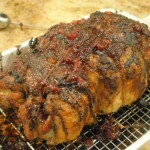 Remove chickens from bag and place on a rack in a roasting pan breast side up but facing the opposite direction. Discard bag and juices. Place roasting pan in preheated oven with chicken uncovered. Roast until chicken looks dark golden, with a tongs inserted into the main cavity give chicken a turn to breast side down to crisp up the other side. When back side is dark golden, open oven and flip chicken again to breast side up. Close oven door and wait about 5 more minutes for breast skin to re- crisp. At this point, juices should be running clear, no blood or pink running out of chicken cavity. Chicken roasts about 1 hour and 15 or 20 minutes. Let chicken rest for at least 20 minutes before cutting and serving. Sometimes it could sit to up to an hour before cutting and serving. I never reheat before serving. Serve chicken after carving and pass blood orange sauce in a separate bowl with a small spoon. It only needs a spoon of sauce. 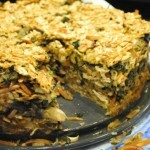 This recipe is easy to multiply and tastes great the next day served cold for lunch. I have had occasion to make extra, freeze it to have ready ahead of time, and take it with us in a cooler.